Afghan Ski Challenge Archives | Untamed Borders - Adventure travel.. This package offers travel and entrance to the 10th annual Afghan Ski Challenge. A ski touring event in the Koh e Baba Mountains north of Bamian, Afghanistan. Difficulty – This is a ski touring trip, so you will need to be fit enough to walk up the mountain. You don’t need to be an expert skier, but you have to be confident and possess the basic skills. Comfort – There is some level comfort. The rooms have en-suite bathrooms and sometimes in the day there is hot water, not the entire day. 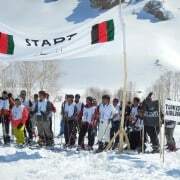 This package offers travel and entrance to the 9th annual Afghan Ski Challenge. A ski touring event in the Koh e Baba mountains north of Bamian in Afghanistan. Untamed Borders was the first company to run ski trips to Afghanistan in 2011. 2020 will be our 10th season running ski trips to Afghanistan and we have again been asked by the organisers of the Afghan ski challenge to arrange packages for competitors. The trip will be led by one of our experienced English speaking Afghan guides for the length of the trip. On the snow you will be guided by a qualified international ski guide in the mountains as well as the local Afghan ski guides. We will meet you at Kabul airport and show you a few places of interest in Kabul before flying to the beautiful and peaceful Bamian valley to ski in the Koh e Baba mountain range. We will also have time to visit the remains of the world’s largest standing Buddha statues that overlook the town and the ancient cities of Shah e Zohak and Shah e Golghola. Afghanistan is a country slowly recovering from years of violence and neglect but it has always been a magnet for the intrepid. The rugged landscape, the ancient history crossed with tough yet incredibly hospitable people is an intoxicating mix. The chance to truly blaze a tourist trail is a rare opportunity. For further details about this trip and the chance to join us please contact us.